The future has arrived with the new AquAid Fusion. This water dispenser is the first to offer both boiling and chilled water in one dispenser. This innovative machine is proving to be extremely popular in work spaces of up to 10-15 staff in meeting their requirements for both boiling and chilled water. The on-trend dark graphite colour of the AquAid Fusion makes it suitable for use in any area in the workplace, including your office, kitchen or factory; and the Hygiene Guard silver impregnated dispense tap reduces bacteria transfer and cross contamination. 18ℓ per hour cold water supply. Hygiene guard silver impregnated dispense tap reduces bacteria transfer. Dispenses up to 7 Cups of boiling water. Saves money on electricity compared to using kettles. Reduces electricity usage by 25%, saving up to £40 per annum. Available as Free Standing Bottle Fed; Mains Fed and as a Desktop Bottle Fed. Also available as a Cold-only version. We aim to schedule both the installation of your water cooler or dispenser and any deliveries at your earliest convenience. We are generally able to deliver bottle-fed water coolers within 48 hours and plumbed-in water coolers within 3-4 days. 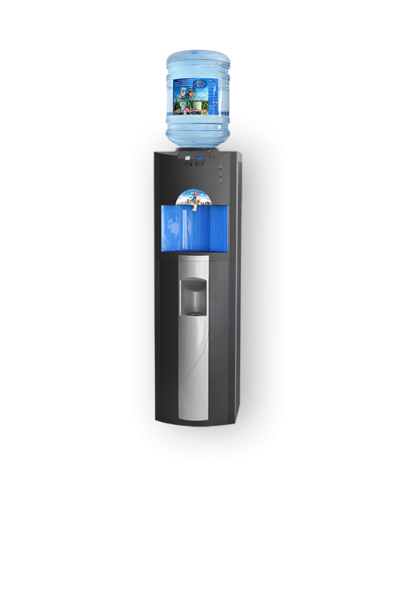 The installation of the AquAid Fusion Bottle Fed Water Dispenser doesn’t just benefit you though. On average, every AquAid water cooler installed will provide four people with water every year.